Today Adobe Labs announced the latest version of Adobe Lightroom, bringing it to version 4.4. 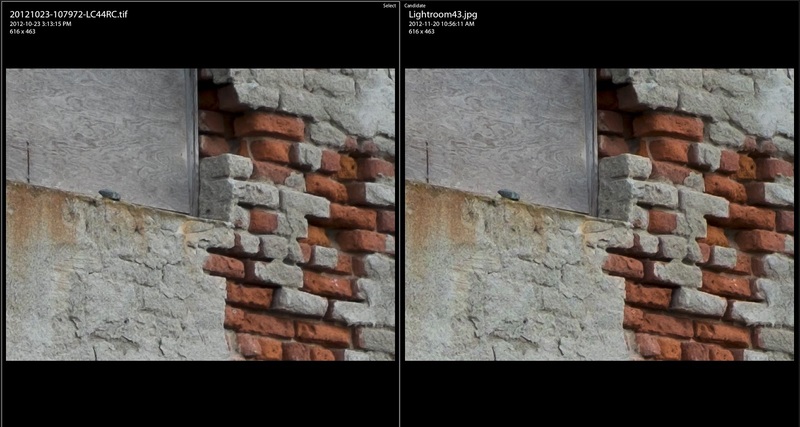 This specific version addresses some of the issues that Lightroom 4.3 had with the X-Trans files from the X-Pro1 and the X-E1. I tested this against two reference files that really pushes the limits of almost a dozen RAW processors I've thrown at the FujiFilm RAF files. I'm please to inform everyone that the dreaded watercolour, or colour smearing issue has been abated in this version which is very welcome. The muddied colours really caused odd colour casts (you can see a slight green tinge in the LR 4.3 version), and obviously the details were also creating the watercolour effect appearance. Although details are still not as good as some of the other RAW processors that I've thrown at it, it is improved over the previous versions. One of the more notable details is in the shadow details. LR4.3 lost a lot of micro details in the darker or shadier areas. LR4.4RC improves that dramatically. But as you can see, the Capture One details are still surpassing what both default settings are putting out in this case. One could argue that Capture One is over sharpening, which I might agree, but I found that it's much easier to deal with over sharpening in Capture One, while in LR4.4RC, it's difficult to sharpen the images without introducing a moire issue (a maze like pattern in some textures). The good news is that LR4.4RC responds better with the Radius setting in sharpness. By reducing the size of the pixel to something like 1/2 pixel, it dramatically reduced the moire issue (I wonder if Adobe was listening in on some of my theories on 1/2 median filtering). So like Capture One, default settings might not be the most ideal setting to use. If you're using RAW processing, you're likely not going to use the default settings anyhow. Lastly, one of the best improvements that I can compare and finally say that if you were shooting only in JPG because you felt the in camera results were the best, Lightroom 4.4RC actually looks much better than the JPG rendering. This is a big improvement over the previous version. Details in the logs above is dramatically improved especially in the subtle shades. 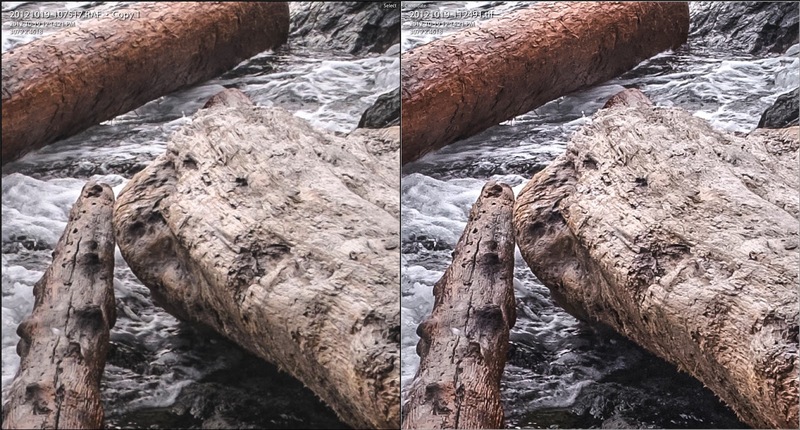 There are some softening of details which is likely a result of a different approach, but it is welcome considering how much of an improvement it has over the previous version's issues and even in camera JPG. Personally I am comfortable to say that Lightroom 4.4 has at least finally matured as a good choice for RAW processing of FujiFilm X-Trans files. Is it perfect? 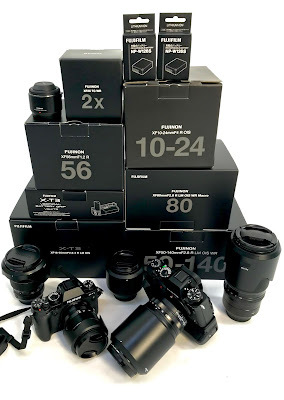 No it isn't, but its improvements are dramatic, and it's apparent that Adobe and FujiFilm did indeed trade information to correct for some of the glaring issues that has kept most FujiFilm X-Trans system owners from shooting in RAW. This is a pretty quick review and I'm still exploring the potential of Lightroom 4.4, but I'm very pleased by the results at this stage. This gave me the best balance of sharpening without too much moire artifacts, specifically the maze like effect that happens on ultra high frequency textures (usually only visible at 200%). The second update is that something an improvement that most people wouldn't know about is something I call Zipper Aliasing (something I mentioned several posts back). This isn't something that Lightroom 4.3 had a problem with (because it never resolved the details high enough), but with the increase of details, it's a fine balance between this unique zipper alias that happens only with the X-Trans files. It is as far as I can tell by looking at just a RAW demosaic file, that it's the Green sensors that cause a unique zipper like pattern to form between certain details (only visible at 200-400%). This was present in processors like Silkypix and DCRAW especially if you over-sharpened. Lightroom's increase in detail did not result in any zipper aliasing when over-sharpening which is good. The trade off of slightly softer interpolation gives better control over that phenomena. Excellent report, Mr. Lam. It gives clarity on this Adobe update. Thanks... It's definitely a good and needed update. Looks like LR will be good enough now for most of the RAF file conversion. I generally only use the Fuji RAW files only for DR maximizing or to cure difficult color casts later in post. 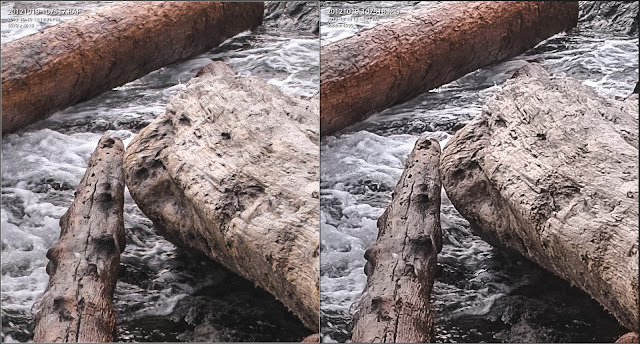 Would you mind to share your sharpening values on the LR sliders that gave you the best results with the sample image? This gave me the best balance of sharpening without too much moire artifacts, specifically the maze like effect that happens on ultra high frequency textures (usually only visible only at 200%). Hi Terrance.. It is nice to have two excellent processors to work with. I am not sure what your preferences are. Capture or Lightroom. Inn looking at the images and I am certainly not an expert, the Capture 1 files seem to pull out more detail than the Lightroom 4.4. What is your take on this? Terrance - have you had a chance to work with the final version of 4.4? I'm curious to hear your comments as to the degree of increased sharpening over the 4.4 release candidate. Have you found that you need to adjust your stated sharpening values? Hi Maury... not got changed on the released version from the RC version. I do find that the .5 radius and anywhere from 50-70 for amount is still recommended. 4.4 is still significantly better than 4.3 but still needs intervention from the default settings.